version of the tune differs from that in all subsequent publications. 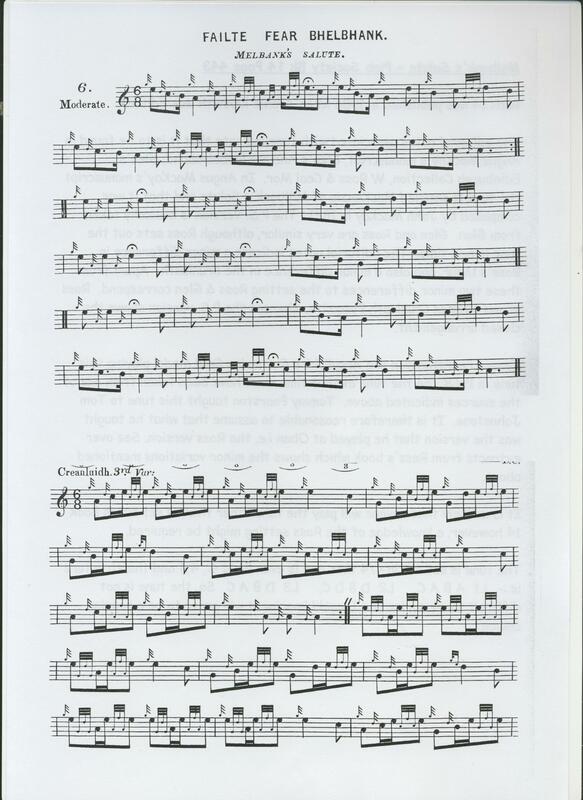 It has been printed in essentially similar form in Glen's Ancient Piobaireachd, Glen's Edinburgh collection (partial setting) W Ross and Ceol Mor and is played in this style by today's pipers. It is also on record in the manuscript of Donald MacKay - Angus MacKay's nephew - and he is quoted by General Thomason as a source for the setting in Ceol Mor. The principle difference between Angus MacKay's version and the rest is that he is two variations longer. This seems to drag out the tune and the PS book 14 setting is similar to that recorded by W Ross and D Glen. Angus MacKay's Taorluath and Crunluath doublings are very defective. All the information is in the PS book 14 note. A well known tune which flows musically and is not difficult to memorise, so is likely to be a popular choice. The tune is found in Angus Mackay's MS, Glen, William Ross and Ceol Mor. The PS 14 version is basically that of Glen, which is similar to Ross's, although the latter sets it out in 6/8 time. Ross has an extra low G/low A couplet, shown as grace notes, in bar two of the ground and elsewhere, before the edre, and this is sometimes played with the low A as a full melody note, as by Thomas Pearston when he won the Gold Medal at the Argyllshire Gathering in 1968, thus adding an extra pulse to these bars. Ross also shows the tune with an 'open' crunluath fosgailte, which is most attractive, while PS 14 has it 'closed'. Ross's score is added below.